Portland Bolt has been a part of many bridge construction projects over our 100+ year history and the Isthmus Slough Bridge on the Southern Oregon coast is another example. 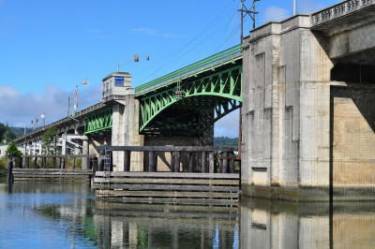 This bascule style bridge spans 1,690 feet over the Coos River. It was originally built in 1955 and is unique in that it is not a mechanized lifting bridge but utilizes a block and tackle lifting mechanism. This bridge style is one of only three that have been built post World War II. We have provided several orders over the course of the upgrade on this unique bridge containing rotational capacity tested A325 bolts, carriage bolts, and long anchor bolts. All of these fasteners required fully domestic material with full certification documents that we automatically email with all orders. With our heading, threading, and galvanizing operations in house, this is a very easy order to fill. With many years of manufacturing experience, we will meet or exceed your fastener standards and delivery expectations.